Uses fantastic fresh fish from the famous North Yorkshire fishing town and some wonderful fresh herbs. Gently sprinkle the mackerel with fennel pollen or cracked black pepper if you prefer. Cut a lime in half and then again into three segments before placing the lime and the mackerel on the bamboo skewer that has been pre-soaked in water. Rub the chilli, fennel pollen and a little zest and juice of lime over the mackerel and allow to marinade. This can be done overnight for a strong marinade or used straightaway if you prefer. Make sure the barbeque is hot or use a hot chargrill pan. Cook the mackerel for around two minutes each side depending on the size of the fish. Peel and destone the mango before cutting it into thin pieces. Add half the coriander leaves, the grated carrot and the baby gem lettuce. Blanch the samphire by quickly dropping it into boiling water before refreshing under a cold tap and adding half to the salad. Peel four strands of cucumber vertically down the whole cucumber. This is a chef trick and what we are all doing now! Finely chop the shallot and the remaining coriander leaves and samphire. Add to this the zest and juice of the limes, a teaspoon of Yorkshire honey and one tablespoon of the Womersley Vinegar. Whisk this together and pour the rapeseed oil slowly into the bowl whisking all the time. Pour the dressing over the salad leaves. You may not use all the dressing so keep it for your next salad. 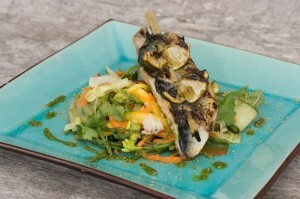 Place the hot skewer of mackerel onto the salad and serve with some of the dressing around the plate.